PIQUED by the ongoing water crisis, President Rodrigo Duterte has threatened to axe officials of water regulator Metro Manila Waterworks and Sewerage System (MWSS) and terminate the contracts of water concessionaires Manila Water and Maynilad Water Services. 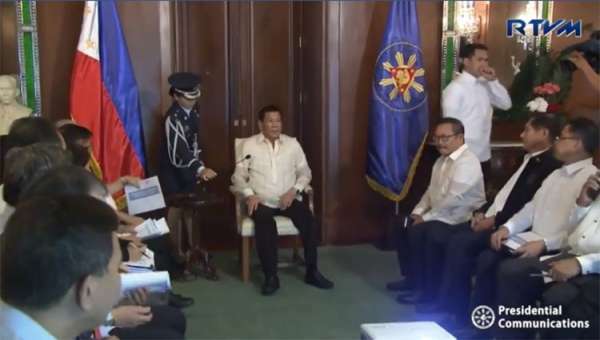 Duterte issued the stern warning during his meeting with officials of MWSS, Manila Water, and Maynilad at Malacañan Palace on Tuesday night, March 19. In a statement released on Wednesday, March 20, Presidential Spokesperson Salvador Panelo described the meeting as a "presidential monologue" that lasted for about 40 minutes and ended abruptly. The infuriated President ordered Metro Manila's water regulator and water concessionaires to submit a report on the water shortage before April 7 so he can decide on their fate, Panelo said. "After which, he (Duterte) will decide whether heads will roll or whether the contracts of the concessionaires will be terminated," the Palace official said. "The Chief Executive told them he was not going to listen to their explanation as to why there was a water shortage as such would be just plain excuses. They simply did not do their job," he added. Duterte and Malacañang have raised concern over the interrupted water services being experienced by some parts of Metro Manila and other nearby provinces since March 7. In an effort to end the water crisis, Duterte on March 15 ordered the MWSS to direct Manila Water and Maynilad to release water from Angat Dam enough to supply affected customers for "150 days." The President expressed his displeasure to MWSS, Manila Water, and Maynilad, as he stressed that water crisis was "not just a matter of common sense," Panelo said. Panelo added that Duterte slammed the water regulator and private water concessionaires in Metro Manila because they "knew of the problem leading to the stoppage of the flow of water but they did not resolve to prevent it from happening." "'All they care about is get profit from the water of the people' and to their sufferance as well. The President told them they could have simply anticipated such shortage and could have done something about it," he said. "They had to wait for him to threaten them with personally rushing to Manila from Davao to grapple with the crisis before they moved to end it," Panelo added. Panelo said the Chief Executive bluntly told them to "shape up or ship out."